Do you know the story behind our National Anthem? Setting: the War of 1812. The British had defeated Washington and had their next goal set on Baltimore. 4500 British Troops on the ground approached Baltimore as the British Navy launched a ferocious 25 hour bombing of Ft. McHenry. But there was a way out given by the British! It was an ultimatum: Capitulate and lay down the colors of the Flag you love or Ft. McHenry will be removed from the face of the earth. The shelling would stop immediately upon the lowering of the Flag; that would be the sign of surrender. There were hundreds of ships in the British Naval Fleet. It was an impossible situation and there was no hope for victory but trust in God! And that’s exactly the path the Americans chose. Hour after hour the Flag on Ft. McHenry’s rampart withstood direct hits. How could that Flag still be standing? All night American prisoners of war were in the bottom of the ship praying…praying specifically that the Flag would remain flying. At dawn it was clear that the Flag, although in shreds but at the top of a tilted Flagpole, was still standing! While suffering repetitious direct hits all night long, when the Flagpole would start to fall, the brave Patriots, knowing full well that all the British guns were pointed directly at the Flag, held it up themselves…with their bodies…until they died. Their bodies were removed and others took their place. What held that Flagpole at that unusual angle were Patriots’ bodies. So much for the separation of Church and State! In the second half of 2015 to this day, Law Enforcement and other Responders are leading the way in Taking A Stand of NONCAPITULATION to the political correctness, to the demands of the ACLU, the FFRF, and other organizations, as well as to those atheists who want to steal the very Christian Patriotic Foundations of this country out from under us. Sheriff after Sheriff, Police Chief after Police Chief, Constable after Constable, and even Mayor after Mayor throughout the U.S. are identifying themselves as true Patriots and Taking A Stand for God and our National Motto by putting “In God We Trust” on their Department and/or city vehicles. 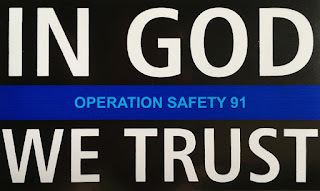 Operation Safety 91 is supporting Law Enforcement and these other Responders and Officials as they boldly and bravely lead the way in this ever growing “In God We Trust” Movement. OS91 has made a 3” x 5” “In God We Trust” thin blue line, car window decal and we ask you to Take A Stand for God and our National Motto with us! Put this decal on your vehicle window, resisting the opposition, not negotiating, not capitulating! Together we need to fight this battle against godlessness until this country again belongs to God!